Hello foodies ! How are you all? Today’s recipe ‘ Dilli Style Aloo Chaat’. It is a common street food of Delhi. It is a simple and easy to prepare tangy potato recipe. So every “Chaat” fan out there, this one is for you. Try this recipe at home, I hope you enjoy this dish with your family. You can share your re-creation of this recipe or any other recipe from Rasoi Recipe on our Facebook page or directly mail it to me on rasoirecipe@gmail.com . I would love to hear from you guys. If you have any suggestions or if you want to share your views or appreciation, you can leave your message in the comment section below. ? For more chaat recipes you can check Pani Puri (Gol Gappa or Puchkas, homemade pani) , Bhel Puri (Mumbai Bhel Puri / Spicy Puffed Rice) , Macaroni Chaat (Pasta/macaroni in yogurt) , Mixed Fruit Chaat (bowl full of flavours . Lemon juice (medium size) 1 no. Use boiled potatoes for this recipe, peel and cut boiled potatoes into small pieces. Shallow fry the potato pieces in a deep pan with 5-6 tbsp. oil on low/medium heat till potatoes turn crispy. For crispy potatoes, you need to fry pieces on low/medium heat. 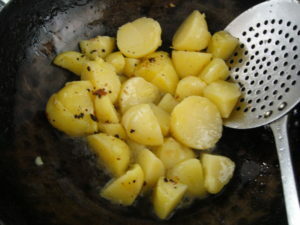 Remove the potato pieces from oil in a bowl. 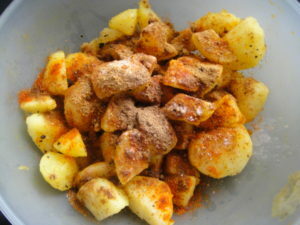 Add all the dry masalas on hot potato pieces and toss everything well to coat masala evenly. Aloo chaat is ready to serve. Serve hot. 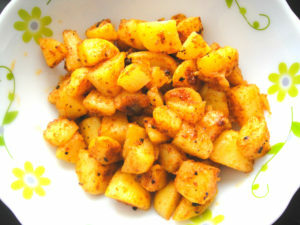 Sprinkle the masalas on the hot potato pieces while they are still hot. Hot oil absorbs the masalas nicely. Thank u Soumya 🙂 Do give it a try. Rattling informative and superb anatomical structure of content, now that’s user friendly (:.